Beta Phi Mu Theta: [PHOTOS] More photos from Theta chapter initiation and party on May 11! [PHOTOS] More photos from Theta chapter initiation and party on May 11! New 2018 initiates! Congratulations, Kat Fanning (r) and Heather Hill! L-R) Chapter Vice President Alexandra Nader, Professor Irene Lopatovska, Treasurer Diane Dias De Fazio. Professor Debbie Rabina (center) enjoys conversation with Irene Lopatovska and 2018 initiation featured speaker Rossy Mendez. Interim Dean Anthony Cocciolo chats with Chapter Membership Coordinator Michelle Lee at the reception. Scholarship season is now open! 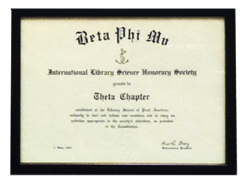 All text and photos copyright of Beta Phi Mu Theta Chapter. Simple theme. Theme images by luoman. Powered by Blogger.